← Does Ed-Tech have an Ethos? So last week while talking with my mother-in-law about the Console Living Room exhibit I worked on last year (my Italian is definitely improving), I mentioned on of the pieces we never were able to get our hands on was a Commodore 64—which was a shame given its influence. She then proceeded to tell me that she is pretty sure they have one in the cantina (Italian for basement). Lo and behold 20 minutes later we were unpacking a fully equipped Commodore 128, the less known successor to the Commodore 64. Late in 1985, Commodore released to the European market a new version of the C128 with a redesigned chassis resembling the Amiga 1000. Called the Commodore 128D, this new European model featured a plastic chassis with a carrying handle on the side, incorporated a 1571 disk drive into the main chassis, replaced the built-in keyboard with a detachable one, and added a cooling fan. The keyboard featured two folding legs for changing the typing angle. …and it wouldn’t fit into the standard wall sockets in Italy, so I was getting nervous. 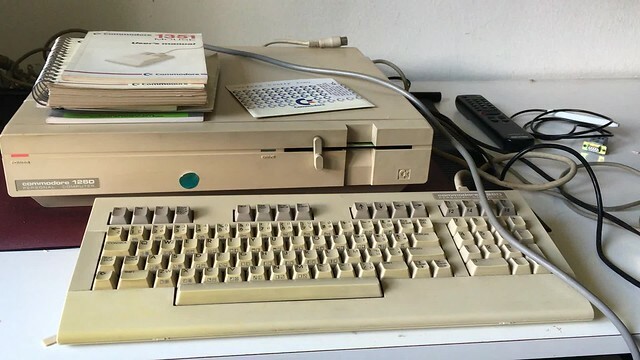 I really didn’t want to fry the C128, so I resisted the urge to just plug it into a surge protector and take my chances despite my impatience. But after some research the next day I was pleasantly surprised to learn that the C128 had the power supply unit built-in. 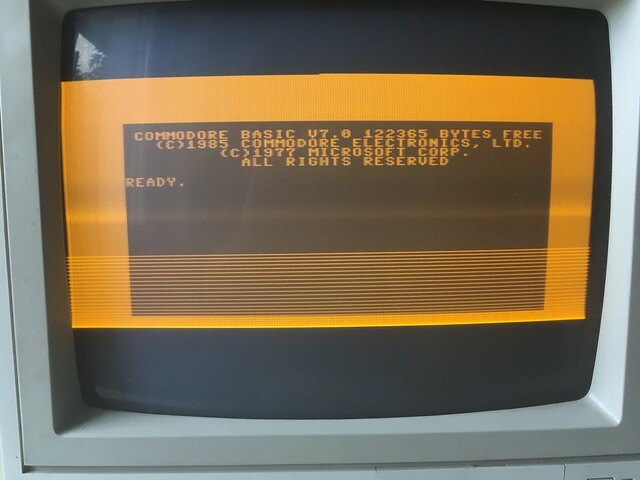 This brief quick comment on this forum gave me the go ahead, “C128-D ? has internal PSU mate!” Awesome, I was ready to see if this C128 worked, and lo and behold it was fully operational! 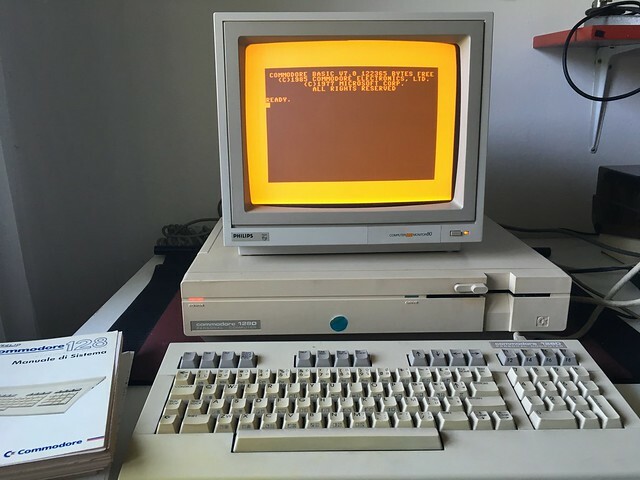 The following video is a quick portal into managing the work the C128 alongside 3 eager kids who are all equally excited about the video gaming potential of this machine! This was very depressing given how crazy awesome that yellow is. I’m doubtful there will be an easy fix, but I am thinking about trying and find a TV repair shop here in Italy to get an expert opinion. Anyone out there have any experience with an issue like the one above? Is it fixable? And we were off an running, we tried to get Donkey Kong up and running, but that was not working. So, we tried a Battlezone knock-off called Tank Attack and that worked perfectly. The computer came with dozens of floppy disks with all sorts of treasures, we’ve only just begun to discover. Necromancer was noted for its oddball concepts and frenetic gameplay. 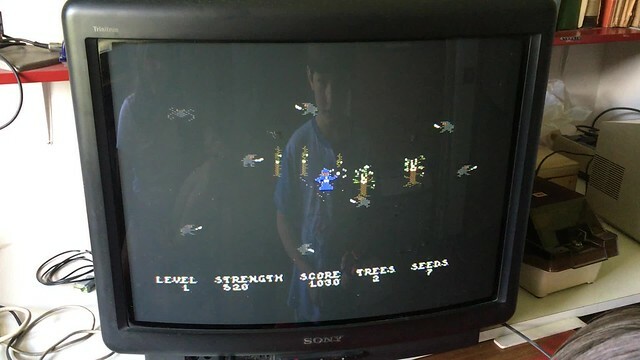 A Creative Computing review claimed it “is one of the strangest, yet most imaginative, games I have ever played on the Atari computer”, and “Necromancer is well conceived and beautifully implemented. 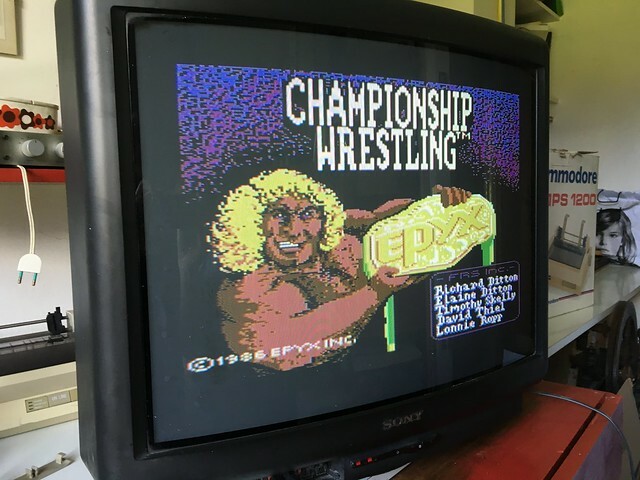 The sound and graphics are out of this world.” Brian Bagnall considered it one of William’s most notable releases on the Atari, among a notable career. 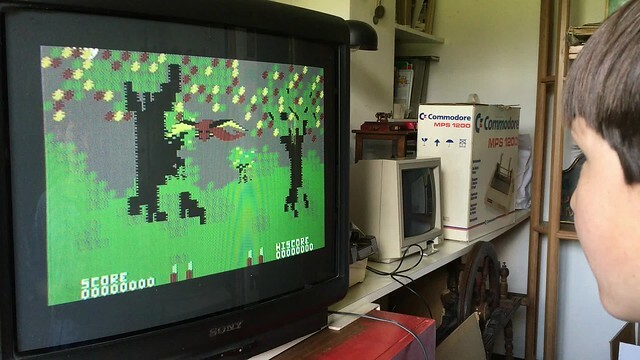 Reviewers continued to pour on the praise even decades later, and it remains a common fixture of articles on retrogaming. We then loaded Forbidden Forest and that was an exercise in figuring out how to shoot a bow, but once you master that the game is fun as hell. It also was a bit 8-but graphic, in the following video Tommaso’s archer gets devoured by giant spiders, and there is some blood! 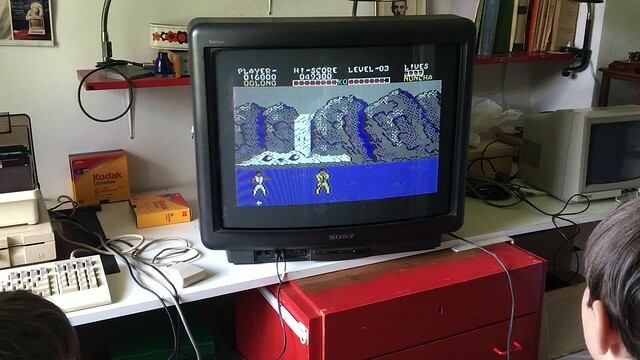 We then hit pay dirt with a C64 version of one of my all-time favorite video games Yie Ar Kung-Fu! The kids also loved this one, and we spend some time working through Nuncha. 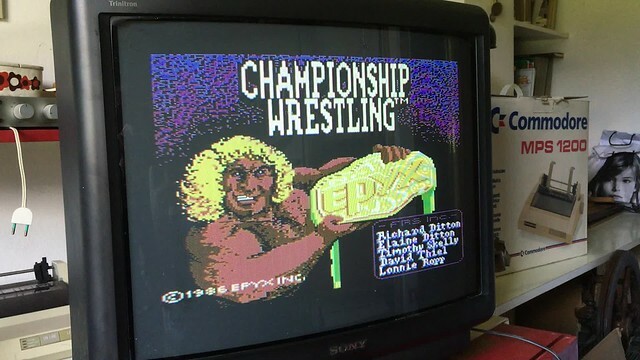 it is actually a bit more difficult than the arcade version cause you only have one joystick and your opponents seem to realize this 🙂 But discovering this on a random diskette made me realize just how many games were made for the C64! 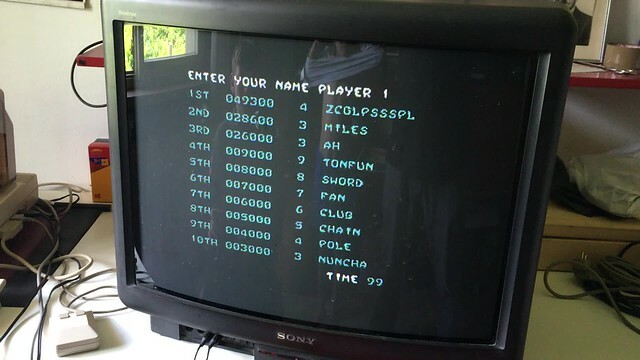 This entry was posted in Commodore 128, fun, video games and tagged c128, games. Bookmark the permalink. A giallo monitor would be perfect. Hope you can get it working. Awesome! I recently had my mom ship me my old 128D but I’m having some problems running disks. I hooked it up to my LCD using one of those converter boxes (like I use to play my Super Nintendo on the projector) and everything starts out fine. 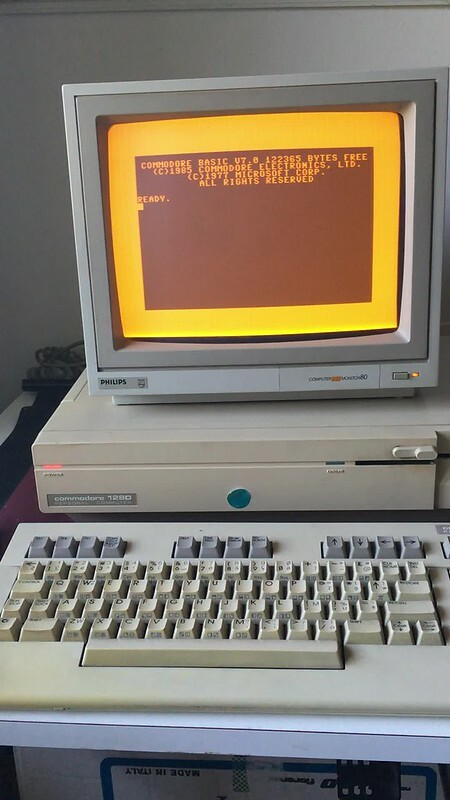 But as soon as I try to load a floppy with the ,8,1 commands it turns to a snowy screen. I tried multiple disks so I’m thinking its either a bad drive? or something with my video cables? Awesome, thanks for that heads up. I kept it, and will look into get the contacts cleaned. You rule! Question about joyport 1.I finally got my 128d going but find out plugs wont fit in joyport 1.Any solutions available? The ports are exactly the same, so should take the same plug. 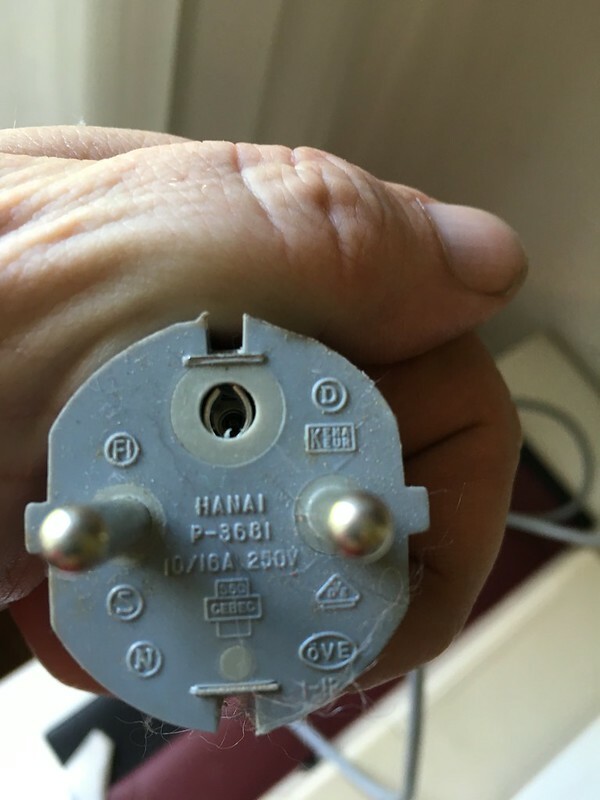 If the same plug works in one port and not the other, I’d look for something physical. It is possible for the outer metal shield which goes around the 9 pins to get bent, which would make it a tighter fit. It also could be a bent pin in that connector.